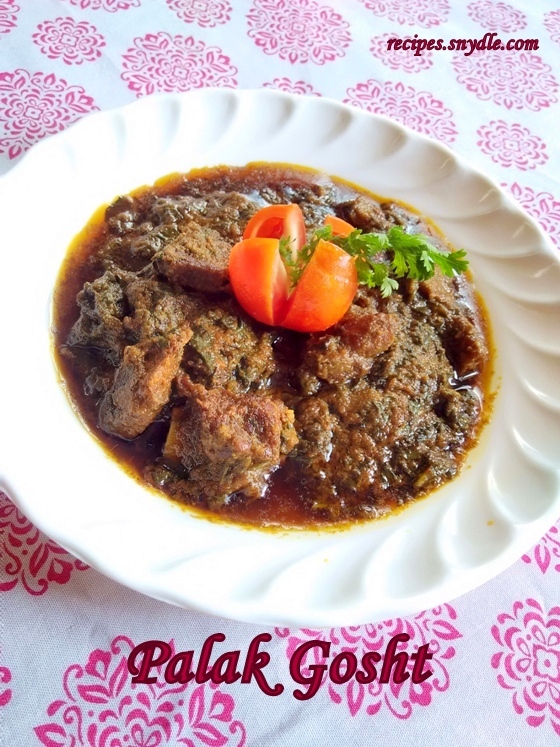 How to make Palak gosht Recipe/Spinach Meat Curry Recipe with step by step pictures. Hi foodies! Most of us do not like spinach. 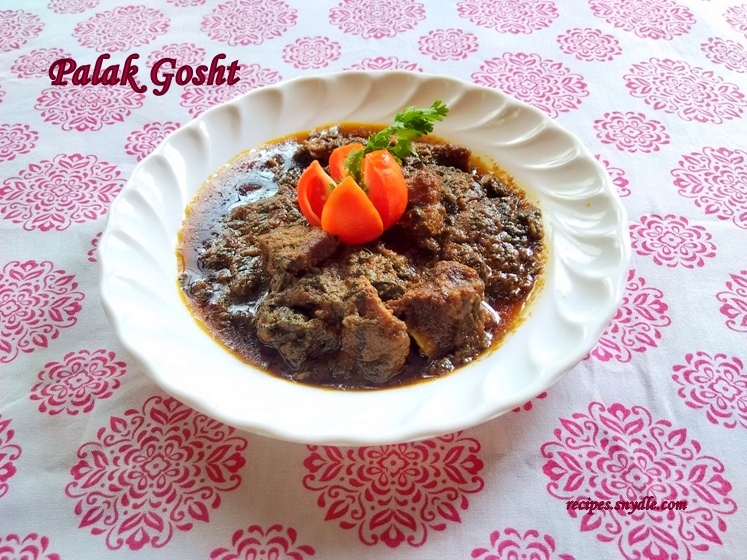 Here is a mouth watering recipe of palak gosht for you. Spinach contains lots of benefit for our body, but we always avoid having it. 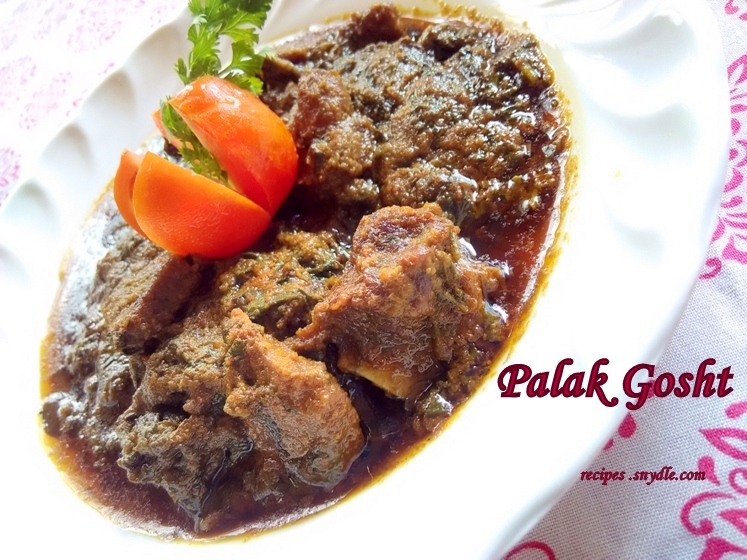 This palak gosht recipe will definitely change your perception towards palak. Spinach improves blood glucose, controls diabetes, reduces risk of cancer and blood pressure, improves bone health and reduces the risk of asthma. Spinach provides protein, iron, vitamins and minerals. Spinach prevents constipation, as well as good for skin and hair. Here I have used raw meat instead of boiled meat. 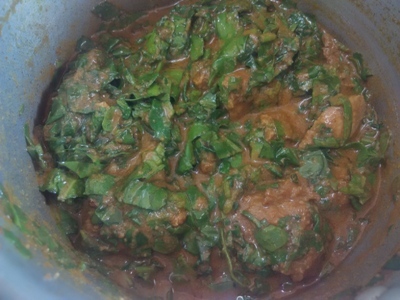 It requires a lot time and efforts to boil the meat and then add to the spinach curry. 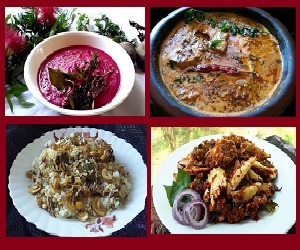 If you are using boiled meat than curry could be made in a skillet or cooking vessel. As I have used raw meat that is the reason I am using pressure cooker. This recipe could also be said as palak goght pressure cooker recipe. 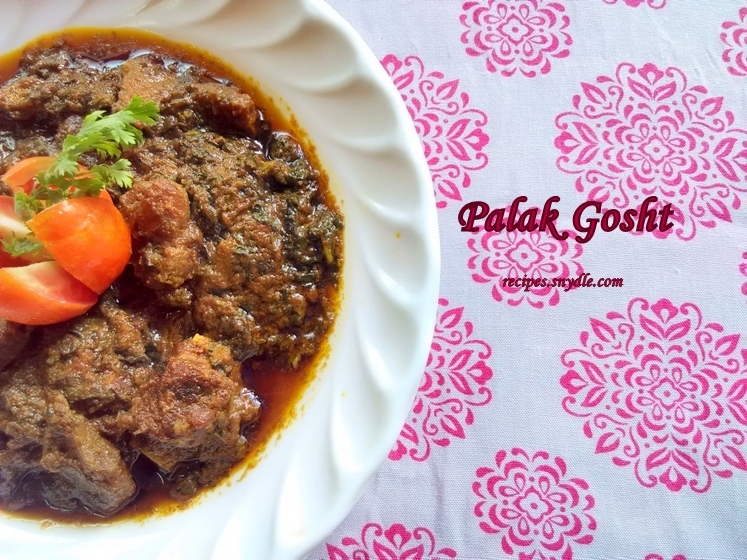 This is a palak gosht easy recipe which requires less time and efforts. 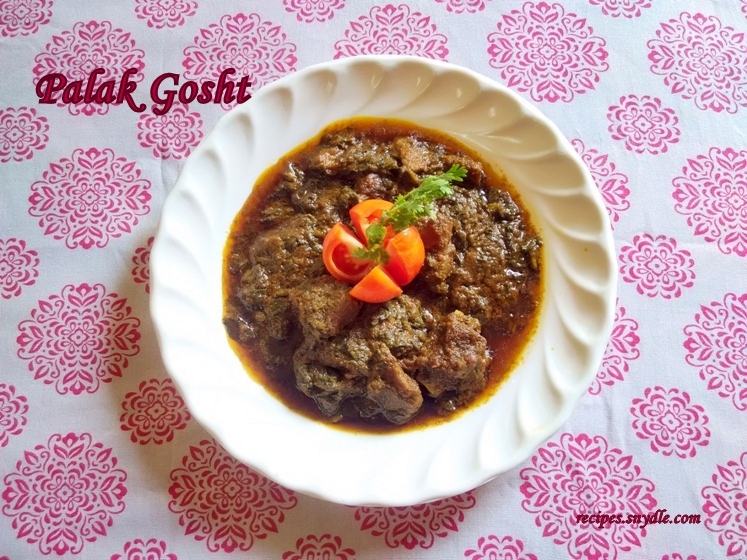 You can use meat, beef or chicken in this recipe for palak gosht. It is also known as palak gosht ka salan. Salan means curry. Kids avoid having spinach so this dish will surely give a rest. Kids will love to have spinach with meat or chicken. Serve this recipe hot with chappati/Indian bread or with jeera rice. 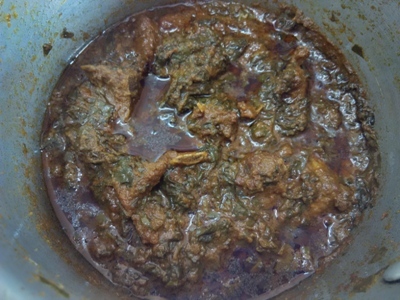 Palak gosht yields 4 servings. For the purpose of measurement, 1 cup = 250ml. 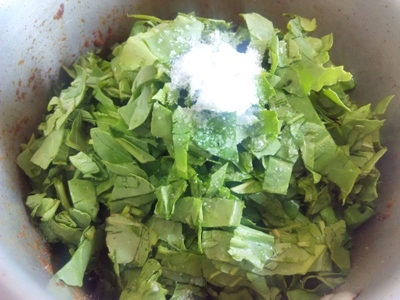 How to make Palak Gosh/Spinach Meat Curry. Wash and blanch the spinach. 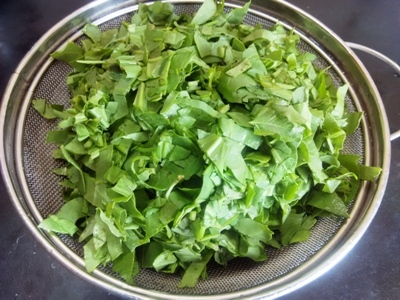 Place the spinach in a strainer to remove the excess water. Clean and wash the mutton/meat well. 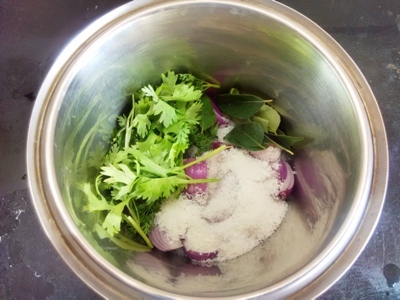 Grind the smooth paste of onion, coconut, curry leaves and coriander leaves. Now add the onion, coconut, curry leaves and coriander leaves paste to the hot oil. 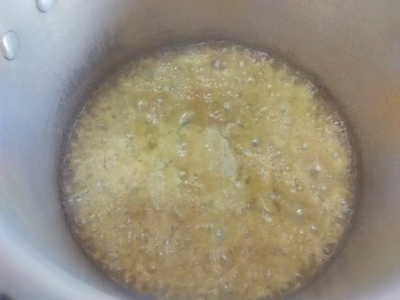 Stir till it gets light brown colour. 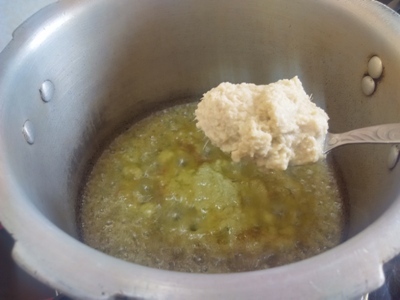 Add ginger-garlic paste to the pressure cooker. 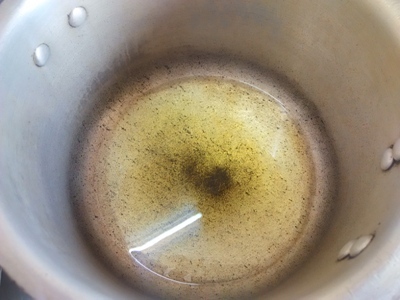 Stir it continuously or else it may stick at the bottom of the pressure cooker. 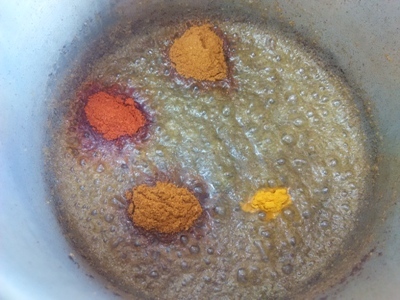 When the masala turns to golden brown colour than reduce the flame to low. Now add coriander powder, red chilli powder, turmeric powder and curry powder to the pressure cooker. Mix it well. 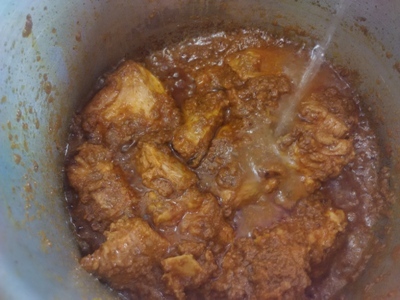 Add 1 – 2 tbsp water if the masala starts sticking to the bottom of pressure cooker. 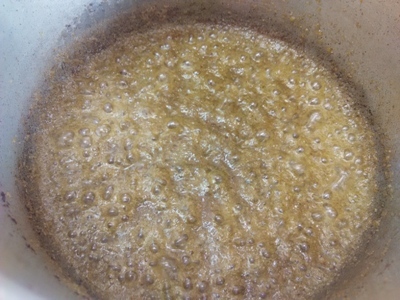 Stir it continuously till the masala starts leaving oil to the edges. 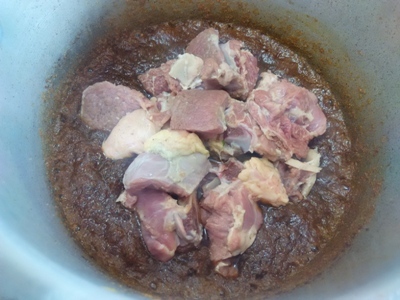 Add mutton/meat to the masala and increase the flame to medium. Mix it well that the masala covers the meat well and the meat gives off the oil. Here I am not raw meat instead of boiled meat. Add ¼ cup water to the mutton and mix well. 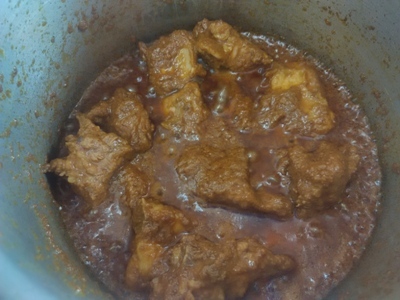 Cook the mutton/meat till it starts to give off the oil. Now add blanched spinach and salt to the mutton. Mix the spinach with meat and masala well and tenders. Close the lid properly. Take 1 whistle on high flame than reduce the flame to low and cook it for 20 minutes on low flame. 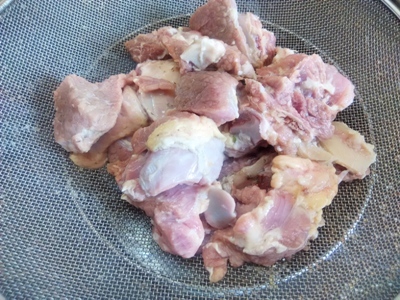 Open the lid of pressure cooker and check one of the pieces of meat, whether it is cooked properly or not. If it is still hard than again close the lid of the pressure cooker and take 1 whistle on high flame. Reduce the flame to low and cook it for more 5 minutes on low flame. Palak gosh is ready to eat. Garnish palak gosh/Spinach meat curry with tomato and coriander leaves. Serve hot. Enjoy! 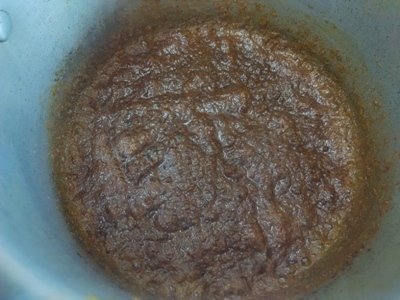 Previous Post: Thekua Recipe/Khajoor Recipe/Meethe Khastte Recipe. Next Post: Masala Moong Dal Recipe.